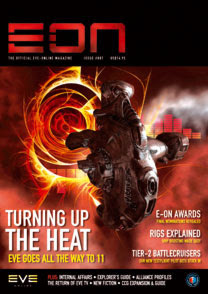 The next issue of EON is on it's way (though I don't know exactly when it will ship). Here the information we have so far. "She can'nae take no more!" is a cry many have heard from a certain brusque faux-Scots engineer over the years, and it's one you may be screaming at your monitor when CCP introduces module overclocking, or rather, Heat. EVE TV's Ifni chats with Tuxford and Hammerhead on how combat might be affected and what the future course is for Tech III and, perhaps, beyond. It's time to announce the candidates you voted for to go through to the final round of voting in the inaugural E-ON awards, in recognition of the unending greatness of the EVE player community. In the magazine we'll profile all the nominees and preview the awards event itself, currently scheduled for July, looking at the London venue and what will be in store for those brave enough to attend. As well as part 3 of our guide to The Second Genesis CCG, Nyphur offers an extensive guide to those new-fangled rig thingamajigs that came out with last year's Revelations I. And if that wasn't enough, the combined literary force of Joerd Toastius and Dnightmare has resulted in a guide to exploration, which serves as a fine continuation of last issue's Probing Guide. With all the hoo-hah happening between the axis and allies in EVE, it's lucky we managed to find a replacement to take over as E-ON's chief test pilot. Step forward Farjung, who knows a few things about ships, apparently, and kicks things off with a thorough appraisal of the Tier-2 Battlecruisers. GM Arkanon talks Internal Affairs, CFO Ívar talks business, we have details on the CCG expansion and an interview with its Producer, great new fiction and news of the return of EVE TV! After a long break from EVE and gaming, I'm back. I should start posting again on a regular basis now that my schedule is under control. Having a child does that to you. Long live the gamer in me! !